This Santa Fe museum offers a new twist on traditional art. This museum offers a deep and colorful exploration of the Spanish Colonial period in New Mexico through art. Even if you’re familiar with New Mexico’s traditional arts, the exhibit GenNext: Future So Bright (on display through March 29, 2019) will open your eyes to a contemporary twist on the some familiar works. The newest exhibit, Paul Pletka: Converging Faiths in the New World (on display through April 12 -October 20, 2019), spotlights amazing artistry and the living link between Christian saints and indigenous deities. Above: Pietá by Paul Pletka, 2014. Photograph by Evoke Contemporary. 1. 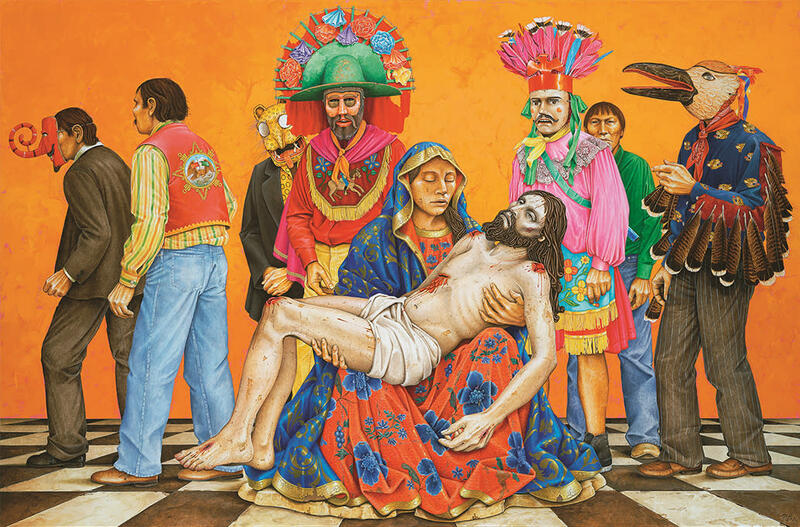 Exhibit looks at contemporary artworks that are rooted in New Mexico traditions. 2. More than 20 New Mexico artists featured. 3. The exhibit includes tinwork, retablos, and bultos as well as found objects, spray paint on street signs, and tattoos. 4. You’ll find a section on artists who break away from the norm, such as Luis Tapia and Nicolas Herrera. 5. The exhibit explores how traditions in artwork have evolved to present day.